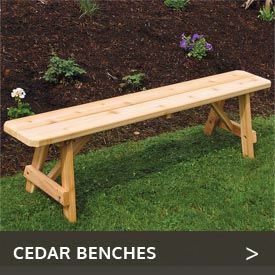 Northern white cedar is an ideal material for outdoor furniture. It’s sturdy and durable yet light in weight, naturally resists weather, insects and rot and requires only minimal maintenance. At Cedarwood Furniture, we offer you a premium selection of Northern white cedar outdoor Adirondack chairs. 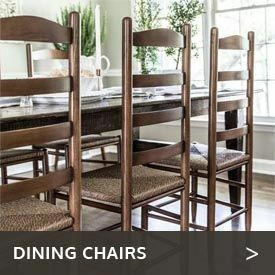 These chairs offer you the time-tested comfort of the classic Adirondack chair and let you take full advantage of the outstanding characteristics of this wonderful softwood, which grows abundantly in northeastern North America. Made in Canada, these cedar Adirondack chairs come complete with rust-resistant hardware. 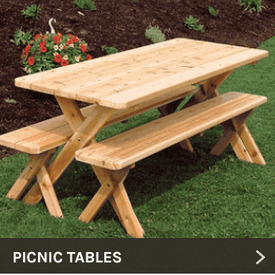 Choose from a selection of sizes, including an oversized white cedar Adirondack chair you can team up with a plump seat cushion or full cushion as options. We also have child-sized Adirondack chairs for the little ones. If you are short on space or like to take your comfy cedar chairs on the road, consider our folding Adirondack cedar chairs. Available in adult or children’s sizes, they fold and unfold in a jiff but offer the same comfort and stability as our regular models.